And don't miss the current job openings at Sprouts Cooking Club right now! I grew up surrounded by great food! However, at college I quickly realized that my exposure to cooking and healthy eating was an exception to the norm. I started thinking a lot about food, and lifestyle. The majority of us do not have the opportunity to learn from an early age HOW to eat well, and WHY we need to eat well. Cooking is intimidating rather than fun because a lot of us aren't taught the basics. Without the know-how to make meals on their own, I noticed that my peers at class resorted to cheap, fast-food options. This perpetuates an unhealthy cycle warped by misleading advertising and unhealthy, cheap ingredients full of preservatives, fat and salt to satisfy their consumers. The simple pleasure of cooking and eating homemade, wholesome foods is distracted by the noise of fast food marketing and trends. A candy bar becomes more enticing than a homemade fruit pie. A burger seems more appealing than a grilled chicken sandwich at home. It was this initial realization that started my Sprouts story. Healthy eating and lifestyle is a big problem here in the United States, and internationally. So I decided to do something about it, bottom up, starting with our youth. I started my good food job! And now I use Good Food Jobs to find people more talented and more experienced than I am to team up with me. I started the concept of my job 10 years ago, while I was a student at UC Berkeley; I launched the Cal Cooking Club so that students could start to learn the basics of cooking, right alongside chefs in their own restaurants. Soon after, I stepped down from the position so that I could focus on the launch and growth of our nonprofit in the East Bay. The goal was (and still is!) 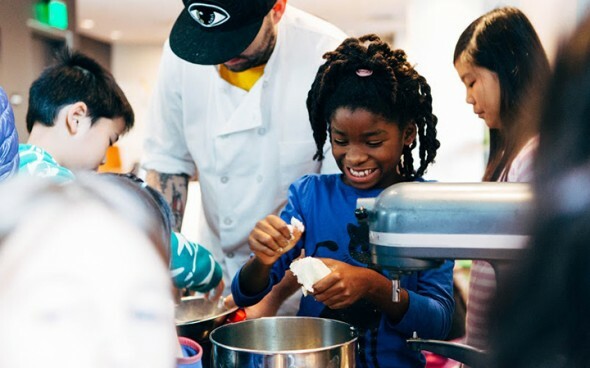 to teach children from all socio-economic and mental health backgrounds the importance of healthy, nutritional foods through hands-on cooking, with REAL chefs with REAL ingredients in REAL restaurants whenever possible. From the very beginning, we offered scholarships to those in need so that children of all social classes might participate in our classes. During the past 10 years, our collaboration with culinary heroes like Alice Waters, Michael Pollan, and Jamie Oliver has propelled our growth by tenfold and brought international attention to our projects! The hardest obstacle was marrying the ideals and vision with the rude reality of paperwork, P&L's, and legal hurdles! It's easy to have an idea, to be motivated to make an impact - and it's another thing to have the perseverance to constantly work out kinks in the system and go against the grain. Even though I was creating the nonprofit with the help of the community and for the community, I often felt alone in my battle to get it off the ground. There were definitely times when I considered calling it quits. Sprouts had grown so quickly that I hadn't been able to create the structure to support its growth quickly enough! I remember one year I took 35 Bay Area kids, parents, and counselors to France for a culinary immersion - and at the end, I was?exhausted! That was probably the hardest thing I've ever done in my entire career! Working for Alice Waters taught me a scads of business, nonprofit, life, and culinary lessons! She was so personable with everyone - and didn't hesitate to take your hand, or look at your directly in the eyes when she talked with you. She included everyone and encouraged the entire office staff and kitchen to sit together at lunch, from the dishwasher to the secretary in the office, to the line cooks and the garde-manger. Marrying health, creativity and taste! Being recognized and well-received for doing things the RIGHT way - not the cheapest, easiest, easiest-to-scale way! Impact! There's nothing more rewarding than being proud of the impact your work has on others. Also: Lifestyle balance! I love my job because it allows me to work hard all the while maintaining my personal equilibrium with excercise and friends. Too many jobs require you to work overtime from the office, and keep you from being excited about life. With my job I have flexibility with my office hours and I get to go on restaurant visits and attend classes.